Little Miss knew exactly what she wanted me to sew - a drawstring bag exactly the same as her library bag, only BLACK. It had to be black!!! She didn't care about the lining, UNTIL I showed her a red / blue / black fabric from my stash... LOL!!! After a little negotiation, we ended up with the brown / pink polka dot fabric, which I do think looks rather nice. The black is an expensive linen from my stash. Yeah, too good for a bag that's going to have muddy soccer boots carried in it, but hey, it's been patiently sitting in my stash for years. I know it will be well used and will stand up to the wear and tear it's going to receive. I could have easily whipped this bag up myself, but I gave Little Miss the option of sewing it herself. 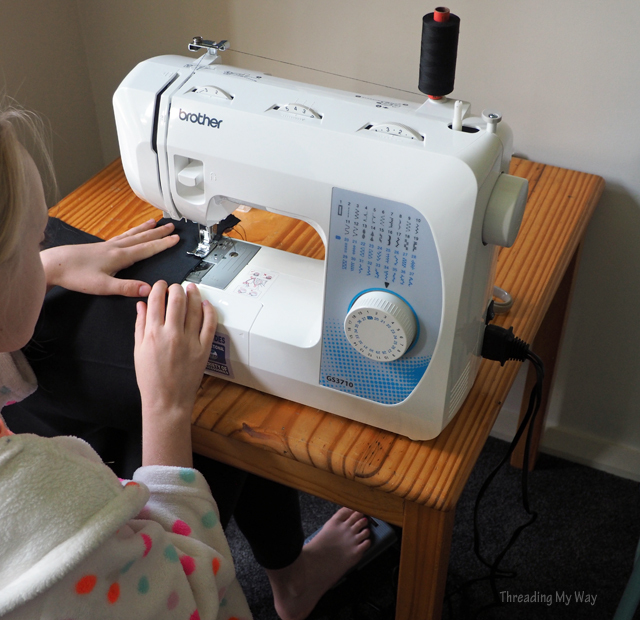 As you can see, she chose to do the sewing. As Little Miss' confidence and skill set improves, I no longer feel the need to hover quite so closely. She's really good at following the rules we have set down. As is to be expected with kids, Little Miss' enthusiasm wavered towards the end, so I finished off forming the drawstring casing. She pretty much did everything else herself. Ha, ha... except where I made a mistake and confused the polka dot for the exterior fabric, hence forgetting to leave a gap - I did the unpicking and fixing up. And threading the drawstring into the casing she couldn't quite manage, but I think that was mainly because she thought she'd jab the safety pin into herself if it came undone. 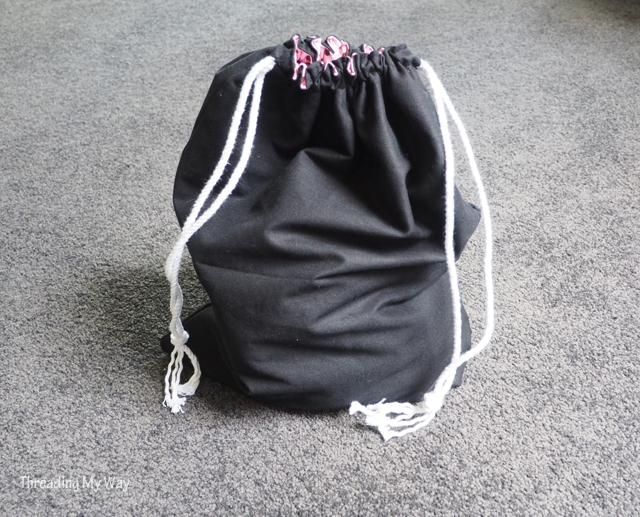 I based the construction on my small lined drawstring bag tutorial, but made a few modifications - mainly size. The soccer boots bag is the same as the drawstring library bag. The bag comfortably holds Little Miss' soccer boots, shin pads and a pair of socks. Little Miss was quite rightly very proud of her new soccer bag, and proclaimed to everyone - I sewed it all by myself!!! Would you have used very expensive fabric for a kid's soccer boots bag? Maybe I'm mad... LOL!!! Fabric is always better used than sitting gathering dust in the cupboard Pam so I don't think that you are mad at all. Celtic Thistle, what a great idea to put loops to open the the bag!!! Thank you for sharing!